Securing a truck to eliminate creep and early separation goes a long way towards ending loading dock accidents. McKinley offers a complete line of vehicle and wheel restraints that make loading and unloading operations much safer for your workforce. We will also service all your restraints to keep them working properly. The Vehicle Restraint, often called a trailer restraint, engages a truck trailer’s rear impact guard (ICC bar) to stop dangerous movement and untimely trailer departure. We offer manual, mechanical and powered models depending on your need and budget. Wheel Restraints are ideal for trucks with damaged rear impact guards, lift gates or unique configurations when vehicle restraints will not work. Staying OSHA compliant can be as simple as using Wheel Chocks. 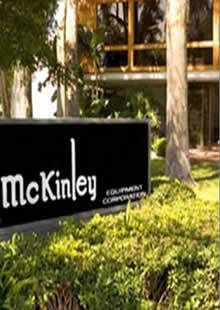 McKinley offers standard molded chocks, heavy-duty laminated chocks, and long-lasting aluminum wheel chocks. We keep a large supply in stock locally so we can install them for you quickly. Contact McKinley’s loading dock experts and they will help you determine the best vehicle restraint solution for you.